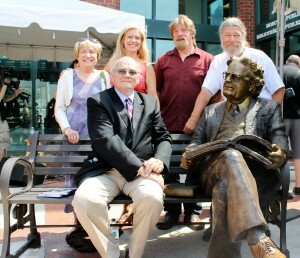 Before the unveiling of the sculpture, the Frye Festival in collaboration with the New Brunswick Public Library Service will announce a major donation by Robert D. Denham to the Moncton Public Library. Professor Emeritus at Roanoke College in Virginia, Robert D. Denham is donating his complete collection of books and objects that belonged to Northrop Frye, along with Frye’s manuscripts, first editions of his books and many other works that feature Frye. This entry was posted in Uncategorized on July 23, 2012 by Joseph Adamson. Then “Northrup” looks a bit askew. An “o” for “u” corrects her plight. For this misspelling of the name.